What happens when you don't notice warnings that your lane on the highway is closing for construction? Insane crashes like this, and that's if your lucky. 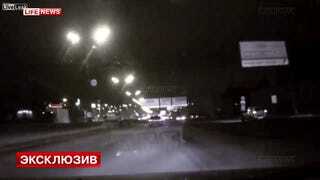 This crash happened on December 20th on a Moscow ring road. LifeNews reports that the 42-year-old Peugeot van driver did not notice construction warning signs and hit a concrete barrier at full speed. Debris hit a number of construction workers, but the driver was the only one injured. He was hospitalized in a state of shock and with serious injuries. That said, he's the lucky one. LifeNews reports that this area has seen five similar incidents in the past month, killing three and injuring four.